In a time of ever-increasing specialisation this work focuses on the broader aspects of Western music, seeking to view its history as a whole and to probe its relationship to other aspects of Western cultural thought. Its basic point of departure is the author's concern with that main aspect of language which is also shared by music, namely rhythm. As a native of Greece Georgiades was struck by the fundamental differences in rhythmic structure between the languages of the ancient world, Greek and Latin, on the one hand and those of the modern Western world on the other and by the resulting differences in the demands thus placed on music. Here is a totally unique approach to the history of music, one which is equally far removed both from the bare factual account and from the broad survey or integrated arts view of the discipline. 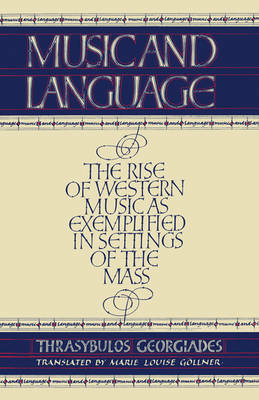 In its combination of close attention to detail with an unwavering awareness of the significance of the whole it reveals many new relationships and interdependencies which should be of interest to all those concerned with the history of Western intellectual-cultural thought, both in music and in other disciplines.